Cyrus Summerlin and Max Hellerstin, who previously created the Push for Pizza app (which allowed users to order a pizza with the push of a button), are officially launching their new startup today, Down to Shop. The app bills itself as both a modern reinvention of QVC and “the funnest way to shop.” It allows users to watch funny videos featuring products that can be purchased directly from the app. To do this, Down to Shop says it has recruited a creative team of Upright Citizens Brigade alums and Instagram influencers like Wahlid Mohammad to star in its shows, which are written, filmed and edited in the startup’s Los Angeles studios. The content is built around four-week seasons, with daily episodes across five shows each season. You can actually download the iOS app now, then swipe through different videos and games. Judging from the videos available at launch, the app is holding true to its promise of “content first, advertising second,” with laidback, tongue-in-cheek shows that also happen to feature promoted products. By playing games and watching videos, you also earn Clout, the in-app currency that be used to make purchases. As for the products available to purchase, the company says it’s already working with more than 60 brands, including Sustain Condoms, Dirty Lemon (water) and Pretty Litter (cat litter). Down to Shop’s investors include Greycroft, Lerer Hippeau and Firstmark. The startup isn’t disclosing the size of its funding, but according a regulatory filing, it raised $5.9 million last fall. Wasting time every night debating with yourself or your partner about what to watch on Netflix is a drag. It burns people’s time and good will, robs great creators of attention, and leaves Netflix vulnerable to competitors who can solve discovery. Netflix itself says the average user spends 18 minutes per day deciding. To date, Netflix’s solution has been its state-of-the-art artificial intelligence that offers personalized recommendations. But that algorithm is ignorant of how we’re feeling in the moment, what we’ve already seen elsewhere, and if we’re factoring in what someone else with us wants to watch too. This week Netflix introduced one basic new approach to discovery: a shuffle button. Click on a show you like such as The Office, and it will queue up a random episode. But that only works if you already know what you want to watch, it’s not a movie, and it’s not a linear series you have to watch in order. For the history of broadcast television, people surfed their way to what to watch. They turned on the tube, flipped through a few favorite channels, and jumped in even if a show or movie had already started. They didn’t have to decide between infinite options, and they didn’t have to commit to starting from the beginning. We all have that guilty pleasure we’ll watch until the end whenever we stumble upon it. Netflix could harness that laziness and repurpose the concept of channels so you could surf its on-demand catalog the same way. Imagine if Netflix created channels dedicated to cartoons, action, comedy, or history. It could curate non-stop streams of cherry-picked content, mixing classic episodes and films, new releases related to current events, thematically relevant seasonal video, and Netflix’s own Original titles it wants to promote. For example, the comedy channel could run modern classic films like 40-Year Old Virgin and Van Wilder during the day, top episodes of Arrested Development and Parks And Recreation in the afternoon, a featured recent release film like The Lobster in primetime, and then off-kilter cult hits like Monty Python or its own show Big Mouth in the late night slots. Users who finish one video could get turned on to the next, and those who might not start a personal favorite film from the beginning might happily jump in at the climax. There’s a rapidly expanding demographic of post-couple pre-children people desperately seeking after-work entertainment. They’re too old or settled to go out every night, but aren’t so busy with kids that they lack downtime. But one big shortcoming of Netflix is that it can be tough to get a satisfying dose of entertainment in a limited amount of time before you have to go to bed. A 30-minute TV show is too short. A lot of TV nowadays is serialized so it’s incomprehensible or too cliffhanger-y to watch a single episode, but sometimes you can’t stay up to binge. And movies are too long so you end up exhausted if you manage to finish in one sitting. Netflix could fill this gap by bundling three or so short films together into thematic collections that are approximately 45 minutes to an hour in total. Netflix could commission Originals and mix them with the plethora of untapped existing shorts that have never had a mainstream distribution channel. They’re often too long or prestigious to live on the web, but too short for TV, and it’s annoying to have to go hunting for a new one every 15 minutes. The whole point here is to reduce browsing. Netflix could create collections related to different seasons, holidays, or world news moments, and rebundle the separate shorts on the fly to fit viewership trends or try different curational angles. Often artful and conclusive, they’d provide a sense of culture and closure that a TV episode doesn’t. If you get sleepy you could save the last short, and there’s a feeling of low commitment since you could skip any short that doesn’t grab you. One thing we’ve lost with the rise of on-demand video are some of those zeitgeist moments where everyone watches the same thing the same night and can then talk about it together the next day. We still get that with live sports, the occasional tent pole premier like Game Of Thrones, or when a series drops for binge-watching like Stranger Things. But Netflix has the ubiquity to manufacture those moments that stimulate conversation and a sense of unity. Netflix’s curators could pick content matched with an upcoming holiday like a Passover TV episode, show a film that’s reboot is about to debut like Dune or Clueless, pick a classic from an actor that’s just passed away like Luke Perry in the original Buffy movie, or show something tied to a big event like Netflix is currently doing with Beyonce’s Coachella concert film. Netflix could even let brands and or content studios pay to have their content promoted in the Zeitgeist slot. As streaming service competition heats up and all the apps battle for the best back catalog, it’s not just exclusives but curation and discovery that will set them apart. These ideas could make Netflix the streaming app where you can just turn it on to find something great, be exposed to gorgeous shorts you’d have never known about, or get to participate in a shared societal experience. Entertainment shouldn’t have to be a chore. Google will soon block in-app embedded browser logins to fight against phishing attacks. Google is taking a big step to fight phishing attempts on its users. In a post on the company’s security blog, Google’s Product Manager of Account Security Jonathan Skelker announced that the search giant will begin to block account sign-ins from embedded browsers within applications. The problem with embedded browsers, as Skelker lays out, is that it leaves Google’s users susceptible to phishing attacks from bad actors. Previously, third-party developers could add web browser instances, like the Chromium Embedded Framework, to their apps. This allowed users to log into a service with their existing Google account without having to sign-up for a fresh account on a brand new platform. While embedded browsers may have made it easy for an app user to sign-up or login, it also made it just as simple for a hacker to carry out a man-in-the-middle phishing attack. Malicious actors could use embedded browser frameworks to essentially eavesdrop on an unsuspecting user and steal their login credentials. Unfortunately, Google can’t differentiate between legitimate sign-ins and a phishing attack through embedded browser frameworks. Because of this, the company has decided to ban this login method outright. The company is urging developers using embedded browsers to switch to browser-based OAuth authentication. Basically, when a user wants to login to a third-party app using their Google account, the app would open up the Google sign-in page through their mobile browser. This way users can view the URL of the site to ensure this is a legitimate Google page and not a phishing website imposter. Google says it will begin blocking sign-ins from embedded browser frameworks in June. “We want your followers to focus on what you share, not how many likes your posts get. During this test, only the person who share a post will see the total number of likes it gets.” That’s how Instagram describes a seemingly small design change test with massive potential impact on users’ well-being. Hiding Like counts could reduce herd mentality, where people just Like what’s already got tons of Likes. It could reduce the sense of competition on Instagram, since users won’t compare their own counts with those of more popular friends or superstar creators. And it could encourage creators to post what feels most authentic rather than trying to rack of Likes for everyone to see. 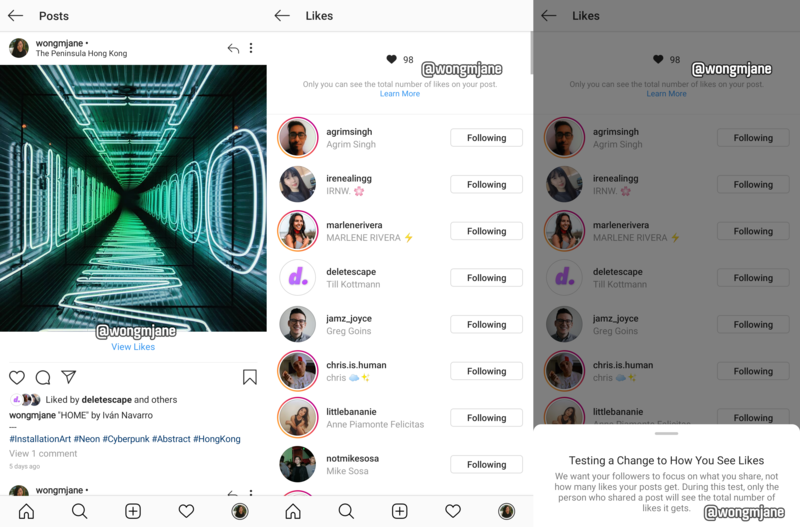 The design change test was spotted by Jane Manchun Wong, the prolific reverse engineering expert and frequent TechCrunch tipster whose spotted tons of Instagram features before they’re officially confirmed or launched. Wong discovered the design change test in Instagram’s Android code and was able to generate the screenshots above. You can see on the left that the Instagram feed post lacks a Like count, but still shows a few faces and a name of other people who’ve Liked it. Users are alerted that only they’ll see their post’s Like counts, and anyone else won’t. An Instagram confirmed to TechCrunch that this design is an an internal prototype that’s not visible to the public yet. A spokesperson told us: “We’re not testing this at the moment, but exploring ways to reduce pressure on Instagram is something we’re always thinking about.” Other features we’ve reported on in the same phase, such as video calling, soundtracks for Stories, and the app’s time well spent dashboard all went on to receive official launches. The change matches a growing belief that Like counts can be counter-productive or even harmful to users’ psyches. Instagram co-founder Kevin Systrom told me back in 2016 that getting away from the pressure of Like counts was one impetus for Instagram launching Stories. Last month, Twitter began testing a design which hides retweet counts behind an extra tap to similarly discourage inauthentic competition and herd mentality. Narcissism, envy spiraling, and low self-image can all stem from staring at Like counts. They’re a constant reminder of the status hiererarchies that have emerged from social networks. For many users, at some point it stopped being fun and started to feel more like working in the heart mines. If Instagram rolls the feature out, it could put the emphasis back on sharing art and self-expression, not trying to win some popularity contest. When reached for comment, a Car2Go spokesperson insisted that there was no hack, but confirmed that there is a pretty big problem. Well, at least there’s that. We reached out to the Chicago Police Department for additional details, but received no response as of press time. However, Edwards tweeted a statement from police that helps fill in some of the gaps. A question from Mashable about what type of cars were stolen — Car2Go offers Mercedes-Benz in addition to smart cars — went unanswered by the company spokesperson. But we have a hunch. So be on the lookout for a Car2Go-branded Mercedes-Benz or two cruising the streets of Chicago, and keep in mind that they may represent the fruits of the sharing economy — just not the kind we’ve come to expect.